Maddy started riding in 2012, having been lured onto a bike by a friend and very quickly made her mark by notching wins in her first year, testament to her awesome strength on the track, and also by having the biggest smile of anyone track centre. Prior to taking up cycling Maddy spent most of her time dangling from a rope as a rock climber, so the conversion to using her legs and lungs was challenging but ultimately immensely rewarding; since she took up cycling Maddy “The Machine” Moore has risen to claim three World Masters Records (actually we suspect it is more than that but she is too modest to keep a tally) and an enviable collection of masters World, European and National jerseys. Maddy’s favourite victories have been those she has been able to share with her teammates including gold in the World Masters team sprint and team pursuit, gold in the European Masters team pursuit, plus silver in the Scottish Nationals team sprint. 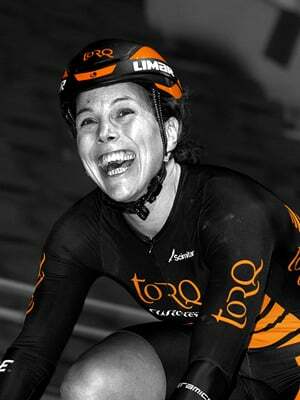 She was also part of the TORQ team which raced the National Team Time Champs and picked up silver and bronze medals in 2016 and 2017. Maddy is such an amazing team player that she can boast about having competed in the team sprint with every female member of the TORQ team (she tells us that “for the avoidance of doubt, Mel Sneddon was definitely the top sprint partner” a comment that will have some fallout). She now only has to persuade Geir and Justin to partake in an open team sprint to complete the full tally of sprint partners. She combines training with working as a solicitor and ensuring local cafes and bakeries remain in business by way of frequent cake stops on winter training rides. This time last week at the #nmtc. I’m still missing everyone! Thanks to @myithlete for helping me to recover this week!